George Herbert Vickery was born in in the 4th quarter of 1876 in New Cross, London to architect George Vickery and Jane Vickery nee Wells. George’s father George Vickery was born about 1847 in Bath, Somerset. At the time of the 1871 Census, George Vickery was a lodger of shopman Henry M. Thomson at 11 Leeds Terrace, Leeds. George Vickery was working as a civil engineer. 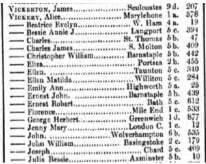 George Herbert’s mother Jane Wells was born about 1844 in Camberwell, Surrey. George Vickery married Jane Wells in the 3rd quarter of 1874 in the Registration District of Dartford, Kent. George Vickery had five siblings: Frederick Arthur Vickery born in the 2nd quarter of 1875 in St John’s, Kent; Thomas Sidney Vickery born in the 4th quarter of 1878 in Sidcup, Kent; Ethel Maud Vickery born in the 4th quarter 1880 in Sidcup, Kent; Henry Francis Vickery born in the 4th quarter of 1881 in Sidcup, Kent and Winifred Vickery born in the 1st quarter of 1884 in Sidcup, Kent. 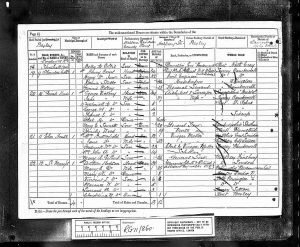 At the time of the 1881 Census, the family lived at 10 Private House, Halfway Street, Bexley, Kent. George Vickery was working as an architect & surveyor and Jane was at home. The household further comprised of their children: Frederick Arthur, George Herbert, Thomas Sidney and Ethel Maud and a general servant and a nurse. At the time of the 1891 Census, the family lived at The Hermitage, Dunheved Road, Croydon. George Vickery was working as an architect and Jane was at home. The household further comprised of their children: Frederick Arthur, Thomas Sidney, Ethel Maud, Henry Francis and Winifred and a cook, housemaid and a nurse. 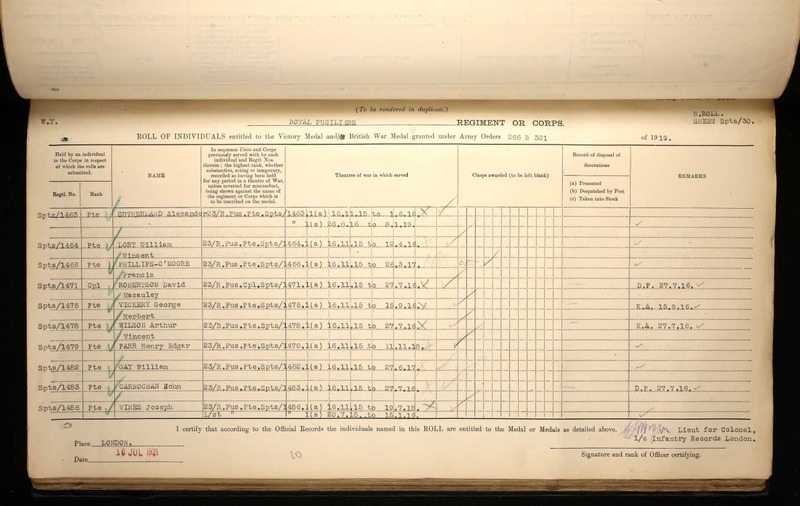 At the time of the 1891 Census, Frederick Herbert Vickery was a boarder of schoolmaster Reginald Hawkins at Marlborough House School, Chistlehurst, Kent. At the time of the 1901 Census, the family lived at Harrowlands, Tower Hill in Dorking, Surrey. George Vickery was working as an architect and Jane Vickery was at home. 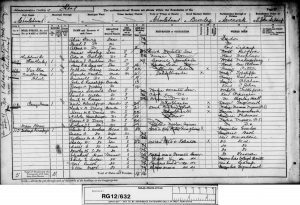 Of their children: George Herbert Vickery was a landscape artist; Thomas Sidney was an architect’s assistant; Ethel Maud was at home and Henry Francis was an articled electrical engineer. According to the Checklist of Painters c1200-1994, George Herbert Vickery was op. 1907-1909. 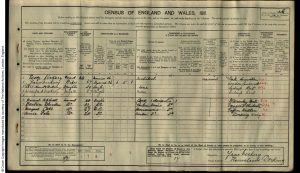 At the time of the 1911 Census, George Herbert’s family lived at Harrowlands, Tower Hill, Dorking. George Vickery was working as an architect and Jane Vickery was at home. The household further comprised of their daughters: Ethel May and Winifred and a cook, parloumaid, housemaid and a under housemaid. The house had 17 rooms. Jane Vickery stated that she had given birth to six children of whom five were still alive. 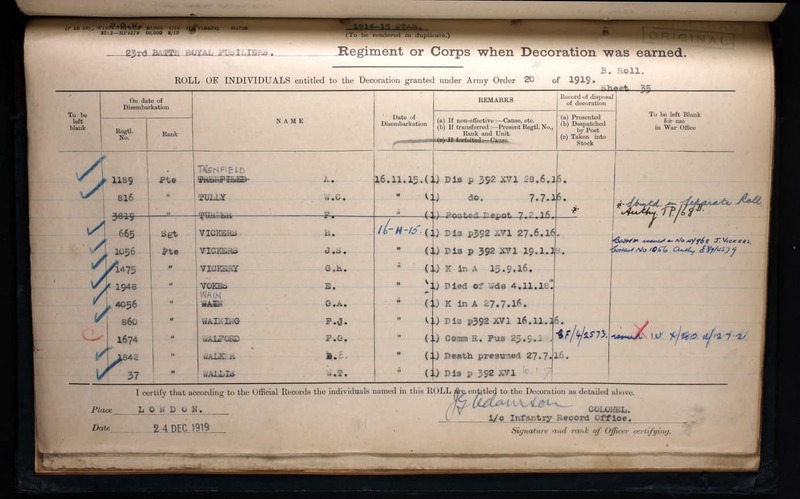 George enlisted in Hornchurch into the 23rd Battalion, the Royal Fusiliers (City of London Regiment). He was a Private with regimental number SPTS/1475. At the time of his enlistment he resided in Dorking. 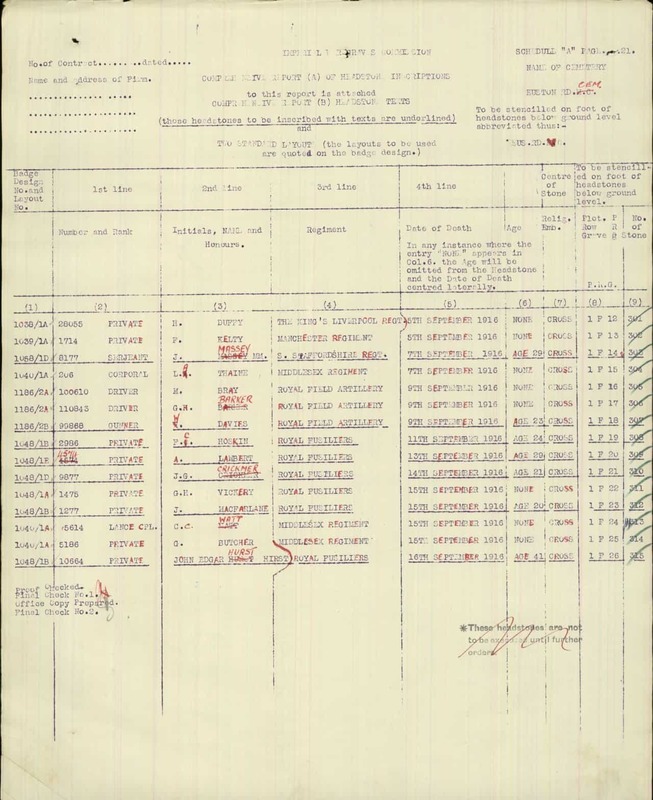 George disembarked on the 16th of November 1915 in France. 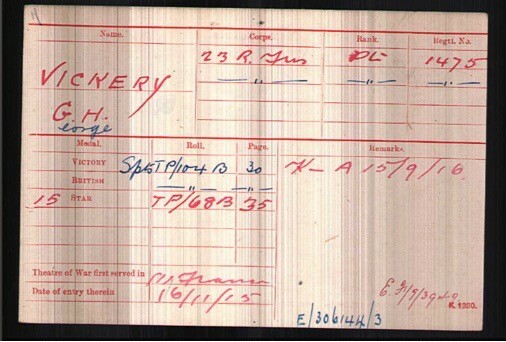 George Vickery died in action on the 15th of September 1916 in France. 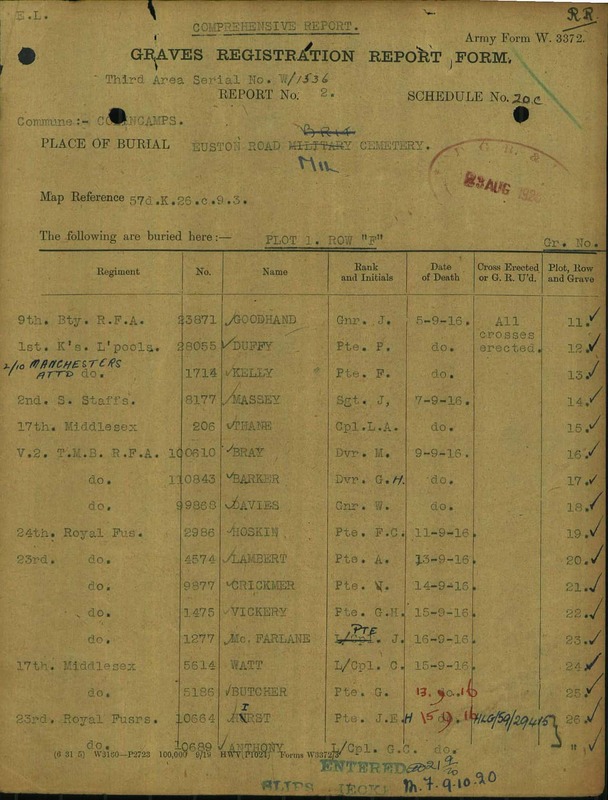 He is buried at the Euston Road Cemetery, Colincamps, France. His grave reference number is: I. F. 22. 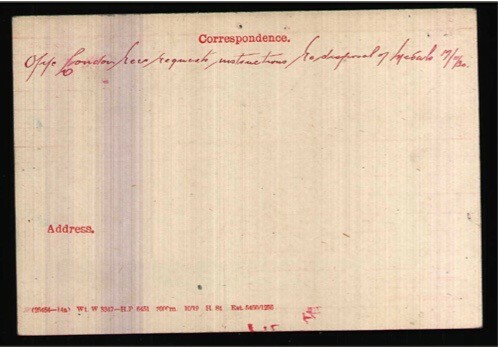 George’s father George Vickery received £14, 18s and 4d on the 20th of January 1921 in Soldier’s Effects. George Vickery was awarded the British War and Victory medals and the 1915 Star.